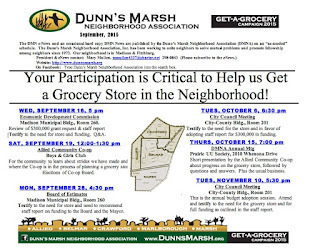 Your Participation is Critical to Help us Get a Grocery Store in the Neighborhood! Are you one of the many people in the Dunn’s Marsh Neighborhood who wants to have a full-service grocery store right here where we can walk to it? If so, please consider coming to as many of the meetings listed below as possible. Showing up at meetings makes a huge difference. Some years back when new liquor outlets were proposed for the neighborhood, we united and beat them back. Now we can unite behind a positive choice for the neighborhood, a grocery store. Come to one or all of these meetings. At the City of Madison, the October 6 and November 10 City Council meetings are the most crucial. 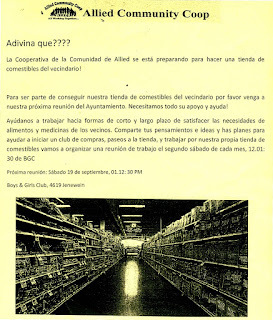 If at all possible, come to those two meetings to sign up in favor of the grant for the store and, if you are brave enough (Sure you are brave enough! ), also check the box to speak. Madison Municipal Bldg., Room 260. Speak or register to the need for store and funding. Q&A. where the Co-op is in the process of planning a grocery store. 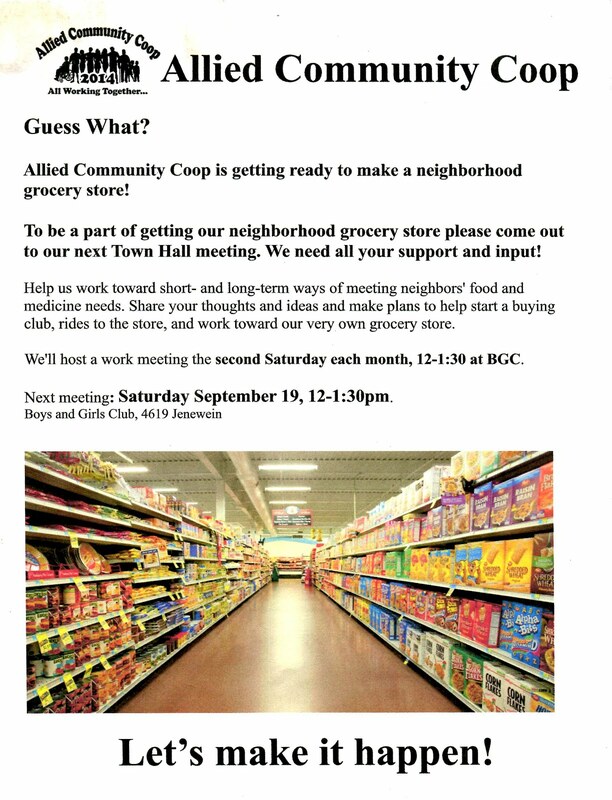 The DMNA is a partner with the Allied Community Co-op. staff report on funding to the Board and the Mayor. Speak to the need for the store and in favor of adopting staff report for $300,000 in funding. Short presentation by the Allied Community Co-op about progress on the grocery store, followed by questions and answers. Plus the usual business. This is the annual budget adoption session. 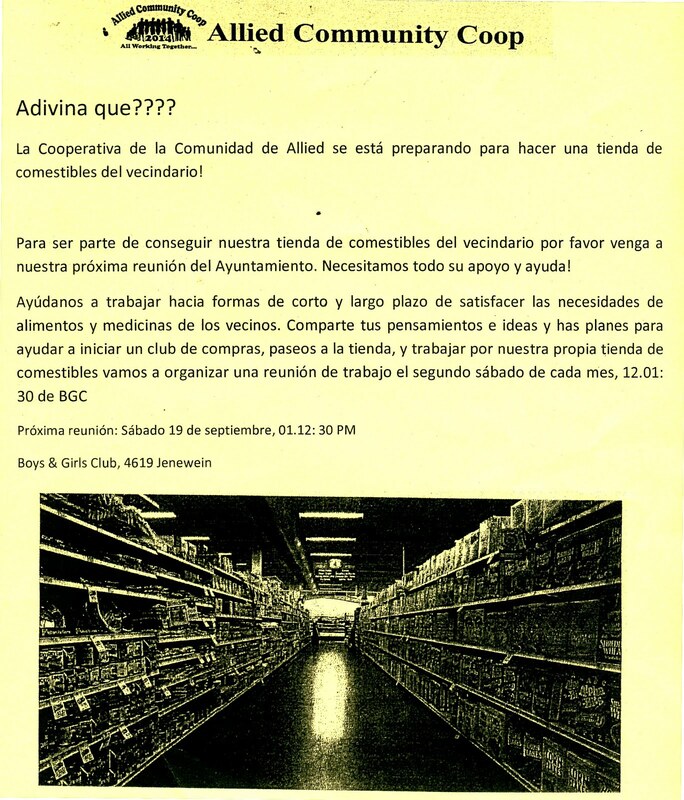 Attend and testify to the need for the grocery store and for full funding as outlined in the staff report.